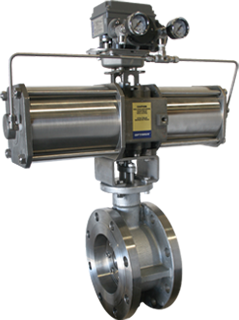 Optimux globe control valves provide superior performance while permitting easy, fast, and inexpensive maintenance. Unlike diaphragm-operated control valves, the Piston cylinder-actuated OpGL™ provides stiffness, maintains high positioning accuracy control – making for the world’s most efficient and accurately responsive valve. Pressure-assisted seating achieves bi-directional shut-off and low breakout torque. The OpDX™ butterfly control valve is a high performance rotary valve with an eccentric cammed disc that ensures accurate throttling. Its same flangless body (wafer) serves ANSI classes 150, 300, and 600 in 2″, 3″, 4″, 6″ and 8″ sizes. With our piston and cylinder actuator, this butterfly valve has greater flow capacity than any globe, plug, and cammed control valve. Rugged enough for hard-to-handle and particle-entrained processes. The OpVEE™ was designed to be used in a wide range of applications, including: chemical, pulp & paper, power, and petroleum services. It has solved many long-standing valve-related challenges, such as tensions in piping that unevenly load the seat, small ranges due to limited orifice characterizations, and unsatisfactory shutoff capabilities. Its integral flanges design standard and piston cylinder actuator deliver plenty of thrust for high performance throttling. High performance eccentric plug valve for a wide range of applications. The Optimux OpEXL™ is characterized by its innovative eccentric plug. Its ‘not-through’ shaft allows uninterrupted fluid flow and delivers higher Cv’s . Regular maintenance cycle surpasses five years for most applications. Available with our line of RPA Rack and Pinion Actuators. High torque and triple offset design ensures zero leakage. 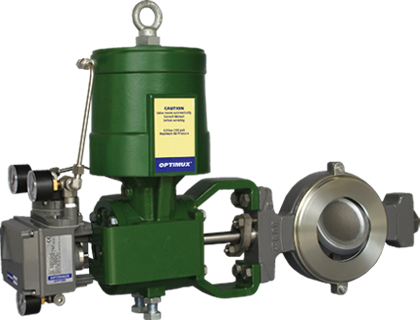 The Optimux OpTE™ triple offset design provides bubble-tight shut-off for critical applications in a wide variety of industrial processes such as petroleum reﬁning, cryogenics applications, pulp and paper and many others. Our unique design also assures low industrial ﬂuid emissions and is fully compliant with the most demanding EPA industry requirements. Legendary robustness and reliability with added flexibility. The Optimux OpTB™ delivers excellent rangeability and accurate control for pressure Classes 150 to 1500 while maintaining critical features such as ﬁre-safe and metal-to-metal tight shutoff. Designed with ﬂexibility in mind, the full bore ball is totally compatible and interchangeable with the new Process Optimizer Ball (POB™). Our new HPP4000 brings to the market all the field proven attributes of our former HPP3000 plus all the additional features our users have requested for the past few years: LCD Display, 4-20mA feedback signal, HART® communication protocol and Auxiliary Limit Switches, all of these within our legendary and well proven robust enclosure capable of sustaining the most rigorous industrial plant conditions. The ALPHATECK Valve Positioner is a cam-characterized, electro-pneumatic valve positioner that provides versatility, dynamic performance, and high positioning accuracy. The versatile design and quality construction allows the ALPHATECK to be used with a variety of actuators. Dynamic positioning accuracy means precise control. Optimux’s spring cylinder actuator is a key element to the OpGL™ excellent shutoff characteristics. 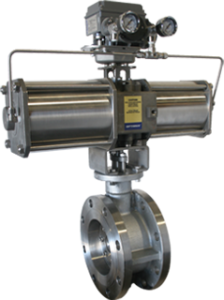 The OpTK™ delivers more than three times the linear force offered by traditional diaphragm actuators while providing excellent throttling characteristics, stiffness and accurate response to control signal. 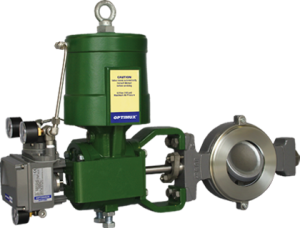 The OpTK™ has been designed for supply pressures up to 150 psi (10.3 Bar), and unlike diaphragm actuators is field-reversible for air-to-open or air-to-close operations without any additional parts. The OpTK™ dynamic positioning accuracy means precise control, and faster response time upon the command of the control signal. The supply pressure is directed to both sides of the piston by the positioner, for stiff and precise actuator operation. This is a significant advantage over diaphragm actuators which depend only on spring robustness and a diaphragm membrane (both susceptible to degradation and wear). Designed for extremely long cycle life. Optimux’s Series RPA represent an excellent alternative to our RA Piston-Cylinder Series for rotary valves applications. As with the RA Series the RPA actuators are compact, allow for field reversibility, provide adequate torque for most standard applications and are easy to maintain. RPA actuators are designed for extremely long cycle life when utilized in normal loading applications. The Series RPA actuators are also offered for all our rotary valves: Series DX and Series VB. One of our core commitments to Optimux control valve users around the world is to ensure the lowest cost of ownership on the market. Trimteck has inventories for most Optimux control valve replacement trims, packing, gaskets, and other soft goods. 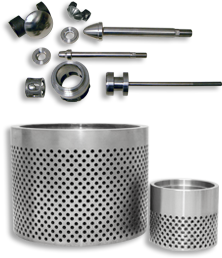 All parts are available in both standard and special materials such as: Stainless Steels, Stellite, Hastelloy, Inconel, Monel, Titanium, Tungsten Carbide, and others. Trimteck also provides an array of severe service trims guaranteed to solve your most challenging noise and cavitation problems. Moreover, Trimteck is proud to offer a broad range of quality control valve spare parts, designed and manufactured using state-of-the-art reverse engineering techniques, as an alternative to other major OEM valve manufacturers including: Fisher®, Masoneilan®, Copes Vulcan®, and Valtek®. Trimteck’s replacement parts undergo a rigorous design, manufacturing, and quality testing process that assures they meet – and often surpass – the original OEM specifications, maintaining precise original mechanical tolerances, and complying with material composition requirements. For more information or to order parts, please click here.